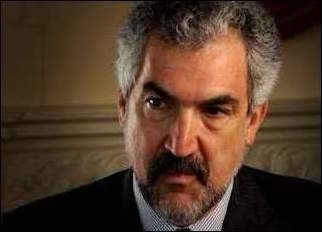 Following recent decisions and declarations by Donald Trump concerning the Palestinian Authority, l'Informale interviewed Daniel Pipes, a frequent guest on our pages and among the foremost international experts on the Middle East. One year after Donald Trump came to office, how do you evaluate U.S. policy in the Middle East? I have many worries about him but at this point I emphatically like most of his Middle East policy. He said that the issue of Jerusalem is "off the table" and that he will further cut Palestinian Authority funds if it does not return to negotiations with Israel. What do you make of these declarations? He is doing the right thing for the wrong reasons. He took these steps to force a restart of the 30-year-old diplomatic process that is harmful and doomed. Israel could well pay the price. In a May 2017 interview, you told L'Informale that Trump has a "mildly hostile" attitude towards Israel. In the light of recent developments, have you changed your mind? For the time being, yes. But I ascribe Israel's good situation more to Palestinian mistakes than to Trump's affection for the Jewish state. If the Palestinians fix their errors, the mood could change dramatically. How effective is the American decision to cut the UNRWA funds? It's not effective at all. The government of Belgium alone offered to pay over one-third of the reduction and many others are following suit – even the Middle East Forum! Plus, cutting money does not address the most consequential and harmful aspect of UNRWA, namely its goal of increasing the refugee population rather than diminishing it. Does the Trump Administration's tough stance towards the Palestinian Authority leave its head, Mahmoud Abbas, unable to engage in further deceits? To the contrary, it invites him again to become deceitful and pretend to "talk peace" with Israel. Do you believe that an eventual Palestinian state is a solution to the conflict; or, with Martin Sherman, do you think this notion is a failed paradigm, an ideological relic from the past? The former (he and I have argued this in print at length): Were Palestinians completely to give up on their territorial claims against Israel and terminate their delegitimization campaigns against it, I would accept a Palestinian state. But that prospect is completely theoretical and, oh, a century off. It seems that the "Palestinian cause" has lost most of its appeal for Arab Sunni states. Turkey and Iran have become its Middle Eastern champions. Is this a turning point? 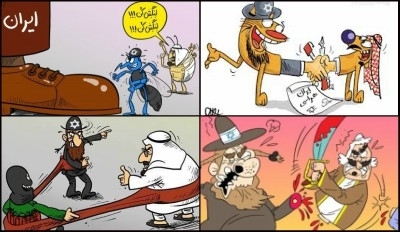 Antisemitic cartoons discrediting the prospect of a Saudi-Israeli alliance are a favorite of Iranian media. A temporary turning point, yes. Once the Iranian threat passes, the Arab Sunni states could well rediscover the Palestinian cause. Do you consider Crown Prince Mohammad bin Salman of Saudi Arabia an asset for Israel? That's a bit strong. I consider him an asset for Saudi Arabia and hope that, among his modernizing efforts, he will diminish Arab hostility toward the Jewish state. In an interview with L'Informale, Edward Luttwak told us, "Iran seems a great power if you look at the situation in Syria, but this image doesn't correspond to reality. In Syria, Iran deploys twelve thousand soldiers coming from Iran, Afghanistan and Pakistan. They belong to Shiite groups and are so poor that they are willing to do anything for 3, 4 dollars a day. ... the theocracy is very good at selling itself and hiding its own failures." Do you agree with this analysis? No. Every party to a conflict has its weaknesses, but to focus exclusively at these without looking at its strengths or at its opponent's weaknesses distorts the situation. That, I fear, is what Edward Luttwak has done. Whatever its problems, the Iranian regime is the Middle East's successful aggressor, now dominant in four Arab capitals. Should the U.S. government work to bring down the Iranian regime or just keep watching and waiting for its eventual demise? The former. It frustrates and amazes me that, through 39 years of Iranian aggression, from the embassy takeover to the nuclear buildup, ending the Islamic Republic of Iran has never been U.S. policy.